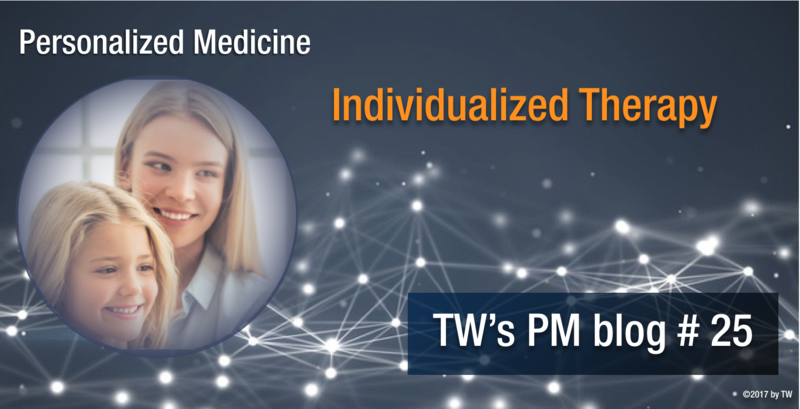 Selecting therapies based on one or some biomarkers found in patients is a hallmark of personalised medicine. When it comes to harnessing the patients own immune system for defence usually against a tumour things turn very personal. We all differ in particular cell markers that identify our own body tissues as self and are responsible for the variety of problems with organ transplantations. Tis is the reason why it is often so difficult to find a compatible, i.e. immune-compatible donor for an organ. Why would medicine go to all the troubles involved with individualising an immune therapy when the result will by definition only benefit a single patient? Tumours are essentially body cells that have gone rouge by some mutations but other than that are still body cells. The immune system has evolved to produce the most swift, specific and effective killers for body cells known to date, called cytotoxic T-cells. No other agent is as lethal and effective in killing tumour cells than these special killers. They are a major reason why most of us do not develop cancer early on despite the fact that every day several cells in our body are converted to potential tumour cells. However, they are sought out and eliminated by these T-cells long before they can pose any heath threat to the body. Usually they are, but at some point some of these cells manage to evade the T-cell purging long enough to multiply and mount defense mechanism against the immune system. This is the origin of a tumour problem in the body. The immune system is tricked into not attacking the growing tumour any more, shields are broken, and cancer can wreak havoc to the body. Since the immune cells have lost their natural ability to attack the tumour they need to be specifically trained to regain their lethal potential. However, this necessitates to know against which targets they should be trained. This is as important to make them effective killers as it is to prevent them from staging a massacre among innocent bystander cells. Therefore, detailed tumour diagnostics revealing what actually went wrong in that specific tumour is mandatory before any immune therapy. Once the targets have been clarified, actual training can commence. The example I use is targeted agains B-cell malignancies because this is where immune therapy is already being used successfully. One of the reasons is that malignant B-cells often carry a specific marker called CD19 which can be used to direct cytotoxic T-cells towards the malignant cells. T-cells rely on a special receptor called the T-cell receptor (TCR) to identify their target cells. Unfortunately, in patients with B-cell malignancies this recognition does not work properly. Therefore, isolated T-cells from the patients are engineered to display a so-called Chimeric Antigen Receptor (CAR) that can be tailored to the specific needs of the patient. T cells displaying this CAR regain the ability to recognise and attack the B-cells again, often further boosted by a second receptor that is directed against the CD19 antigen. The supercharged T-cells are then expanded in vitro and transplanted back into the patient where they further multiply and eradicate the B-cells they encounter most of which are malignant anyway. 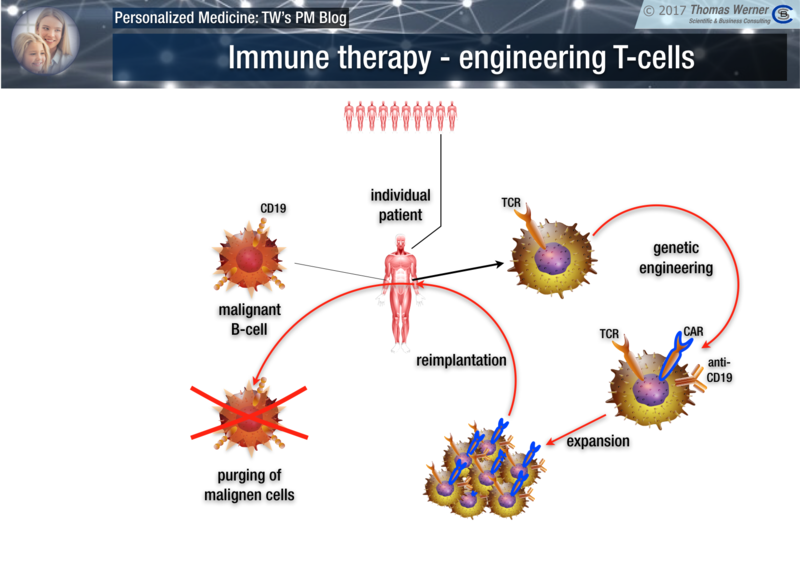 Immune therapy has three phases. First get the T cells and arm them to be the most lethal killers of tumour cells possible. Then make sure they will survive in the host body long enough to do their job. This is done in part by preparing the field for the T-cells with adjuvant other therapies (antibodies, cytokines, etc). And finally make sure that the supernatural killers can be reigned in again after they have done their intended job. Especially preventing any attack on normal cells which might end with an autoimmune disease or worst case might kill the patient. This is attempted by either making the killer potential dependent on a particular drug (no more drug no more killing) or by incorporating suicide mechanisms into the engineered T-cells that can be triggered externally. Next week I will come the next logic step after initial treatment: treatment monitoring which aims at determining the success of lack of success of a treatment on a molecular level. This usually precedes any clinical results by weeks or event months.